If you have been following me, then you know I have been receiving this foodie subscription box for a while now. This month's Degusta Box unboxing is a little over due which just means you will be getting a better review of the products in it. And as always, new subscribers can get their first box for only $12.99 which includes a free gift and free shipping. First, what is Degusta Box? 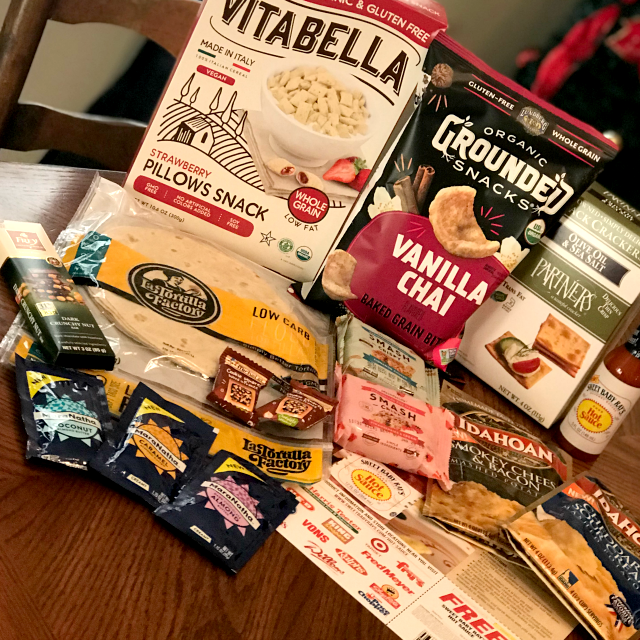 Degusta Box is an on-line food subscription service that delivers a monthly surprise box containing the latest and best products, from small and big brands alike, to the homes of the consumer: saving time and money. You can cancel anytime. Chocolat Frey. With more than 25% nuts and made with authentic Swiss chocolate, these premium bars are a delight for all nut and chocolate lovers. My review: I received the Dark Crunchy Nut which had hazelnuts in it. It was delicious. It was hard to not eat the whole bar! Partner Crackers. These delicious, slow-baked crackers are made with real honest ingredients, like buttermilk, extra virgin olive oil, and a touch of sea salt. They're perfect for snacking on their own or pair them with anything from hummus to the fanciest of cheeses. My review: We ate these with chili. I was doing a Shelf Cooking Challenge and only using products in my pantry. Basically you don't really go to the grocery store except for fresh products. Anyways, my family loved them and ate the entire box in one sitting. MaraNatha. Satisfy your afternoon craving with a MaraNatha packet, the perfect on-the-go snack. Try all three flavors including Dark Chocolate, Caramel, and Coconut. My review: We actually haven't tried these yet. I'll try to update when we do. RV $9.99 for 12 oz jar, I received 3 sample packets. Vitabella Strawberry Pillows are an ideal breakfast alternative for a tasty start to your day, or as a healthy snack. My review: Both my kids LOVED these! I gave them as a snack to my kids. My son asked me to buy more. Lundberg Family Farms. They've mastered the right balance of rich vanilla mixed with warm cinnamon, and exotic spices to create a superb Vanilla Chai flavor sensation. My review: My kids enjoyed these. They didn't have a lot of flavor, just a tiny bit sweet. SMASHMALLOW SMASHCRISPY is no ordinary crispy rice treat. This epic smash up is made from only the very best simple ingredients and packed with flavor for a tasty twist on a classic. A guilt-free, every-day, any-time of day treat for your taste buds that's just like you remember - only better. My review: My kids said they tasted like rice crispy treats. Sweet Baby Ray's. When it comes to hot sauce, there's really no such thing as overdoing it. With a hearty kick of aged cayenne and garlic, this brand-new sauce will soon become your go-to for just about everything. So, go ahead: Slather. Eat. Repeat. My review: My husband hasn't tried this yet and I'm not a fan of hot sauces in general, but I do like their barbeque sauce. La Tortilla Factory. Their most popular tortilla is low in carbs and calories and high in fiber, protein, and flavor. With only 4g net carbs, each of these tortillas is packed with 3g of protein, and only 45 calories. Plus, they're made with unbleached wheat flour and no GMOs. Goodness in hand! 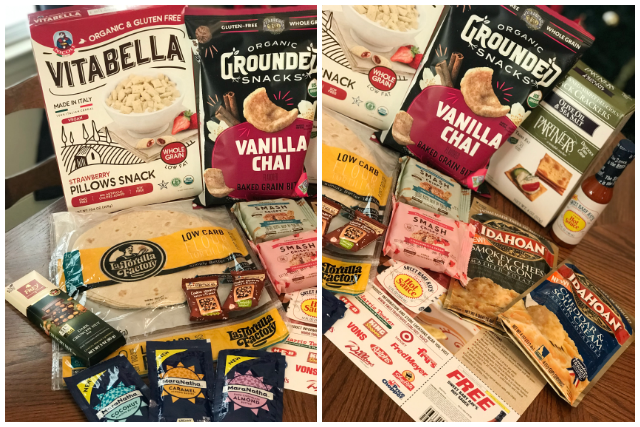 My review: We haven't tried these yet either, but La Tortilla Factory products have been featured many times in Degusta Box and we are a fan of them. Idahoan Foods. For those who can't get enough of a good thing, their Idahoan Cheddar & Sour Cream perfectly blends 100% REAL Idaho Potatoes with flavorful cheddar and smooth sour cream. Idahoan Smokey Cheese & Bacon perfectly blended with smoked cheddar and tasty bacon for a delicious favorite. My review: We are on a low carb diet so these haven't been tried yet. We will most definitely though! Michel et Augustin Cookie Squares are baked in France with butter, chocolate, and amour! Made with ingredients you could find in your kitchen, each recipe brings together crispy shortbread and a dreamy, creamy chocolate ganache. A perfect, indulgent snack! My review: We received two tiny samples, so I put these in my daughter's lunch box as her "treat". She loved them! 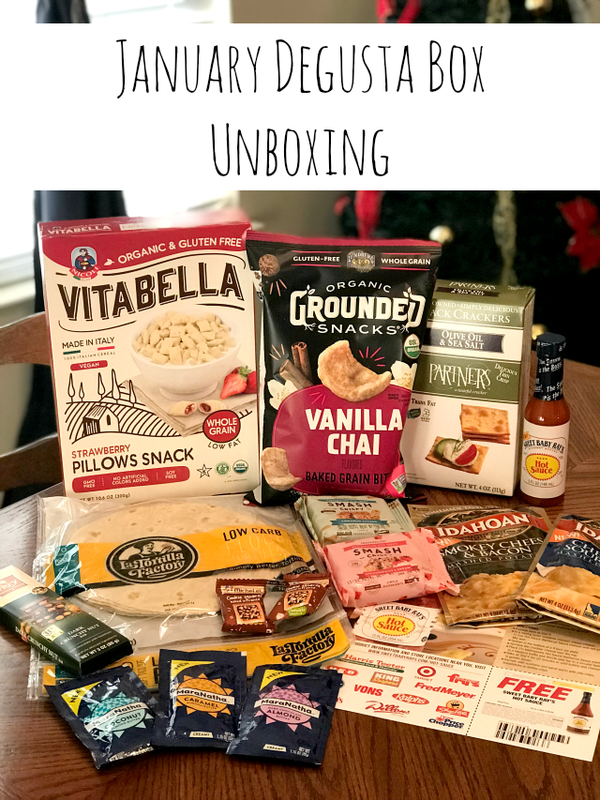 The retail value of this box was about $35 (not including free product coupon) and my readers can score a box of your own for only $12.99 (normal price is $19.99) plus free shipping AND a FREE gift too! Just click HERE and your discount will be automatically applied at check out. What do you think of Degusta Box?